Heading into the Vegas 7s the Eagles wanted to get over the hump of finishing outside the top four with a strong finish. Despite a 21-10 loss to South Africa in the 3rd/4th place match the Eagles have to be happy about achieving that goal, if not a little frustrated that they didn't make it to the final. The windy, and at times rainy, conditions made it difficult on all teams and with that disruption the Eagles could never really find their feet against the South Africans. Now their attention will turn to Vancouver next week where they will play New Zealand, France, and England in a brutal pool. Additionally, with the finish the Eagles are now tied with Argentina for fifth place. Similar to their matches against Fiji the U.S. were on the wrong side of the whistle early a couple of times. Even with that both teams had opportunities through knock-ons and other errors. It was South Africa that would eventually score first. From helter skelter play in which the U.S. nearly broke out a couple of times the ball broke to South Africa where Tim Agaba went under the posts for the try. The Eagles did their best to respond and when Danny Barrett made a big run off a handling error the Eagles were close. The ball eventually went to Test who was tackled at the five meter line. From the ruck the ball was thrown out to an open Eagle but the wind caused the ball to go forward leading to a knock on. That missed opportunity was soon made up for when the team was able to find Perry Baker out of the wing for the try. It began with a great turnover from Hughes to win the ball at the breakdown and then an even better skip pass from Niua out to Baker. Hughes tried to adjust his conversion to the wind but it suddenly died down leading to a 7-5 score. Soon after the restart the Eagles were called for being offside. With the possession South Africa ran through a couple of phases before Seabelo Senatala made it 14-5 at halftime. When the U.S. spilled the ball early in the second half that gave South Africa their third try, this time through Branco Du Preez to push the score to 21-5. Responding, the Eagles gave it one last big push. Aided by a yellow card to South Africa for cynically killing the ball the U.S. had a couple of goes at powering over for the try. 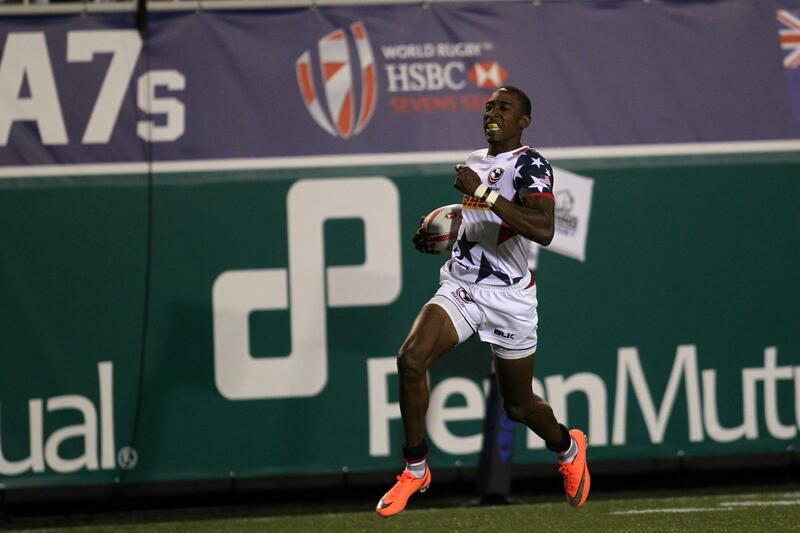 It led to a five meter scrum and from that scrum the ball was worked out to Carlin Isles for a try in the corner. Unfortunately for the Eagles that would be all they'd get in the match as Fiji were able to hold on for the win. Overall, there were a lot of positives in the tournament for the Eagles. They gained some confidence back and they broke back into the top four. However, there are injury concerns with Maka Unufe and Will Holder very unlikely to play next week. Also, there were some non-wind caused errors that will need to be fixed. All in all, a good weekend with a lot of positives. Starters: Niua, Bender, Baker, Barrett, Test, Hughes, Iosefo.